Need more info or want to rent a week at this resort? Please click here to learn about currently available condo vacation rentals at the Palm Springs Tennis Club Resort. 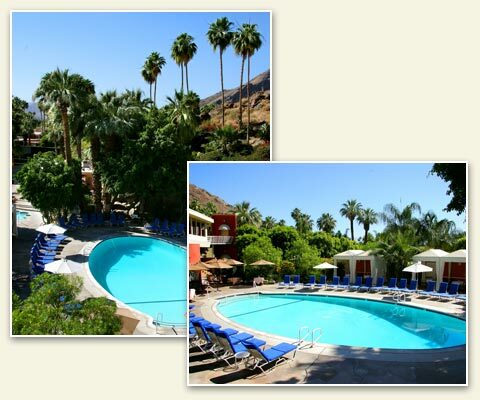 Palm Springs Tennis Club offers elegant lodging accommodations in studios, 1BR & 2BR condo vacation rentals. The Studio condo (sleeps 2) provides 1 bathroom, Murphy wall bed or queen bed, and kitchenette. The One bedroom condo vacation rental (sleeps 4) includes 1 or 2 bathrooms, king bed, queen sofabed, and a full kitchen. The spacious two bedroom villa (sleeps 6) offers a king bed in the master, 2 twin beds in Bedroom 2, a queen sofabed, 2 bathrooms, and a full kitchen. All suites are equipped with hair dryer(s) and DVD player. Please note that the maximum occupancy in each suite includes children regardless of their age.